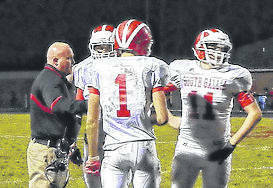 Former South Gallia head football coach Jason Peck, left, talks with his players during a timeout in the 2011 opening round of the Division VI, Region 23 playoff contest against Buckeye Trail. Peck has been named the new head football coach at River Valley, his alma mater. BIDWELL, Ohio — There’s no place like home. After putting close to two decades-worth of effort into the coaching ranks, Jason Peck is finally coming back to the place where it all started. Peck, a 1996 graduate of River Valley High School, was officially voted in by a 5-0 count as the seventh head football coach in Raiders’ history at the Gallia County School Board meeting held in late March. Peck — who served as the Hocking College defensive co-ordinator in 2017 before spending seven years as head coach at South Gallia — is returning to his roots, both as a person and also as mentor to prep athletes. Peck also spent a decade as an assistant coach during the early years of South Gallia’s existence before becoming the Rebels’ frontman in 2010. Peck, who followed Justy Burleson at SGHS, led the Red and Gold to half of their four playoff appearances in 2011 and 2015 and accumulated a 33-39 record during his tenure. Peck takes over a River Valley program that went 26-45 over seven years under Jerrod Sparling, who resigned last November following a 3-7 campaign. Sparling put together an 18-13 mark between 2014 and 2016, including the program’s only playoff appearance in 2015. Peck — who has taught at River Valley Middle School during his coaching stints at SGHS and Hocking College — acknowledged that he really enjoyed coaching football at the collegiate level, but there were always less than a handful of jobs he would consider returning for at the high school level. And this one, coincidentally, was always at the top of his list — for a variety of reasons. “Being a graduate and having worn those colors myself when I played in high school, there is just a pride that comes from knowing that I am the head football coach at my alma mater,” Peck said. “I’ve been fortunate to coach in Gallia County before and to have had the opportunity to coach at the collegiate level, but there’s something truly amazing about being able to come back home and be part of something truly close to my heart. Peck joins a RVHS head coaching list that includes Jack James, Merrill Triplett, Larry Carter, Gregg Deel, Jared McClelland and Sparling, with Sparling serving as the school’s all-time leader in wins. Though there have been more losses than wins during the program’s 26 years of existence, Peck feels honored to join those half-dozen men in leading the Silver and Black on Friday nights. Peck’s previous experience on the sidelines, as well as in the Gallia County School District, made his hiring a somewhat easy choice — despite numerous applications for the gridiron opening. RVHS athletic director Richard Stephens was very excited to welcome Peck — a former Raider teammate — back to the Silver and Black family. As he noted, there were just a lot of pluses to this personnel decision. Besides tying Burleson for playoff appearances at SGHS, Peck also took the Rebels into Tri-Valley Conference Hocking Division play at the start of the 2010 fall campaign — his first season as head coach. Besides a 25-31 league mark during his seven seasons, Peck’s leadership also produced the school first TVC Hocking player of the year in Johnny Sheets back in 2016. The Rebels also finished ninth in the Division VI, Region 23 playoff rankings during the 2013 campaign. Peck’s Rebels were well-known for a physical style of play that resulted in solid defensive squads that produced offense through a punishing ground attack. Peck is hoping to bring some of those same characteristics from his days at South Gallia into his new world at River Valley. The venerable mentor also believes that the kids are going to take to what he’s teaching. Despite being hired six months from the start of the 2018 gridiron season, Peck doesn’t feel like he’s at a disadvantage that most other coaches would probably be in during a situation like this. After all, he’s now coaching kids that he’s previously had in classes, or even just knowing them through his high school friends. Regardless, Peck’s glad to be home — and hoping to take his alma mater to new places. He also thinks some familiarity with everyone will help with the transition process. “I’ve been fortunate to coach football in the Gallia County School District once before, and I know the support I’ve always received in the past was as top-notch as anywhere you could want to be … from the administration on down. It truly does feel like a homecoming, even though I technically never left,” Peck said. “I played football with some of these kids’ fathers 20-some years ago in these colors, so I know how much it means to everyone involved in the River Valley community. I also think the community and the kids know how much it would mean to me to build something really successful here, year-in and year-out.